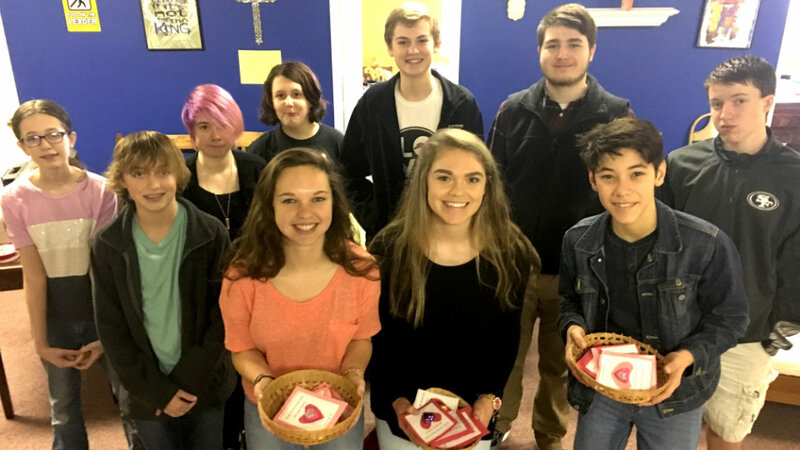 The Teen Hub Group made Valentines for our Golden Age Members. The Teen Hub Group is different from other Hub Groups. We start each meeting with open discussion about our past week. We share good news and bad news. We laugh at embarrassing stories and ask for advice in complicated situations. After we all share, we usually participate in a fun group activity that relates to the week's topic. Next, we discuss our topic, read scripture, and brainstorm how that scripture fits in our lives. We also meet for fun activities outside of the church, such as pizza and movie nights, overnight trips, and service opportunities. As a Teen Hub Group, we want to read and discuss scripture, but we also want to apply that scripture in our lives. We are improving our relationship with God and forming relationships with each other. We would love for any other teenagers to join us! We meet Sunday mornings from 9:15-10:15 on the third floor of the church.